Things will be hotting up in St Helens next month when a taste of Latin America comes to the town centre. 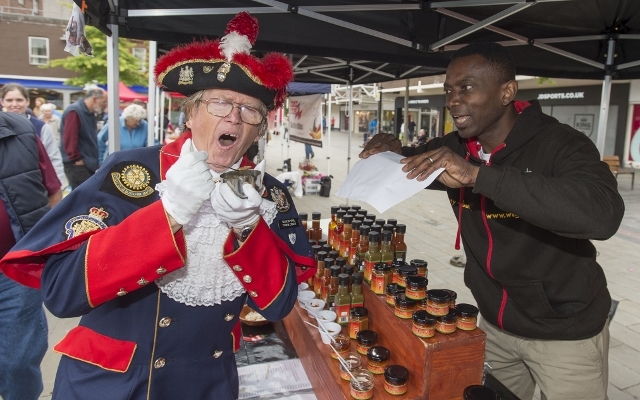 Back by popular demand, St Helens Chilli Village Fiesta – run by Chilli Fest UK and supported by St Helens Council – will see a variety of chilli producers from around the country exhibit their products in Church Square. New to this year’s event is the introduction of Clash of the Titan, a nationally run and recognised chilli eating competition -not for the faint hearted – which involves 10 people battling it out to be crowned Chilli Titan Champion by eating some of the hottest chillies around. To add to the occasion, a ‘Boogie Wondervan’ will be parked up in Church Square, where a DJ will play Latin music and perform the bongos – which is sure to be music to the ears of town centre visitors. From mild to titan slaying extreme chilli sauces, naga cooking sauces, naga dips, chilli pickles, chilli plants, chilli cheese and chilli jam – all to be washed down with chilli cider and chilli beers – this day of chilli mayhem is likely to have even the most seasoned hot food lover hot under the collar. Speaking ahead of the event, organiser Alexander Mustang of Chilli Fest UK said: “Following last year’s successful St Helens Chilli Village Fiesta, which attracted over 2,000 over the course of the day, we’re very much looking forward to returning to St Helens for an event which promises to be even bigger and better than the last. “We’ve heard all about how competitive the people of St Helens can be so if that’s anything to go by – our Clash of the Titan competition should be very interesting indeed. St Helens Council’s Town Centre Manager, Gary Maddock, added: “I’m delighted that we are able to bring high quality events like this to St Helens. Working in partnership with the private sector is critical to the development of the town centre and borough. “With the recent announcement of the town centre development strategy, these are really exciting times for the borough as we look to bring together a town centre that the people of St Helens can bet proud of. If you think you can handle the heat, St Helens Chilli Village Fiesta will take place in Church Square on Saturday 23 September from 10:30am to 5:30pm. Entrance is free. Clash of the Titan competitors must be over 18 years of age, have no medical conditions, and will be asked to sign a waiver before taking part. For more information, please visit www.chillifest.net, or follow @chilli_festival and @chillititan on Twitter. For regular event updates on what’s happening where and when across the borough, ‘like’ www.facebook.com/whatsoninsthelens/ on Facebook – or ‘follow’ @whatsonsthelens on Twitter.